Leading indigenous energy services company, Nigerdock, has been applauded by the Nigerian Content Development and Monitoring Board (NCDMB) for its persistent efforts toward promoting local content and developing the nation’s human capacity, as 49 vocational trainees recently graduated from the Nigerdock Training and Development Academy. The vocational trainees comprising 47 young men and 2 ladies are secondary school leavers, who commenced their on-the-job training (OJT) in May 2016 and 24 trainees acquired skills in welding with (international: 6G and 6GR certifications and Nigerdock Certification of Completion -NDCC). At the academy, 19 of them were trained in fitting and 6 were trained in machining. At the graduation ceremony held at the Nigerdock facility located at Snake Island Integrated Free Zone (SIIFZ), the Executive Secretary of the NCDMB, Engr. Simbi Wabote, who was represented by Manager, Capacity Development Division, Engr. Iwhiwhu Maurice Kelly, appreciated Nigerdock, Samsung Heavy Industries and TOTAL for further deepening local content and improving Nigeria’s Human Capacity Development through its world class training academy. “We commend Nigerdock, Samsung Heavy Industries Ltd and TOTAL Upstream Nigeria Limited because we are confident that these vocational trainees have been trained in various skillsets that empower them to provide the necessary manpower and services for the sector and they can compete with their counterparts in other parts of the world,” he noted. Engr. Iwhiwhu also appealed to the graduating trainees to be good ambassadors of the Academy. He commended all the stakeholders for completing the training safely. The National Human Capacity Development (NHCD) plan for the training was designed as an on-the-job training model. As such the trainees witnessed the fabrication of various structures on Egina FPSO Project and provided support during the project. In addition, some of the trainees witnessed activities in other areas of Nigerdock’s operations like the shipyard division and offshore logistics division. 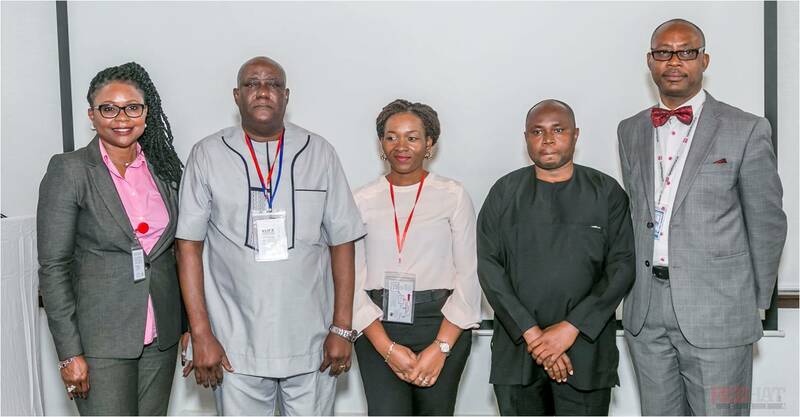 Egina NHCD trainees fortuitously happen to be the first set of trainees to graduate from the recently rebranded Nigerdock Training and Development Academy. The former Training Centre was established in 1986, and has as so far trained about 30,000 Nigerians in various skillsets and discipline in the oil and gas industry, awarding globally recognized certificates. Group Corporate Affairs Director, Jagal, Mrs Joy Okebalama, reaffirmed Nigerdock’s commitment to continuously champion local content development in Nigeria. She also lauded Samsung Heavy Industries Nigeria LTD, TOTAL and NCDMB for supporting the program. Present at the graduation ceremony were Group MD, Jagal Energy, Mr Chris Bennett; Human Capacity Development Manager, Nigerdock, Mr Emeka Anazia; Nigerian Content Manager, Samsung Mr Imo Kalu Imo; Mrs Amarachi Chibundu Manager, Egina Partners and Authorities Relations, among others. Earlier this years, 48 professional trainees graduated from the Academy upon completion of their on the job training under EGINA FPSO Project. Nigerdock Training and Development Academy is Nigeria’s foremost indigenous training institution offering the highest quality and competence needs-based training for the oil and gas sector.